TWC client At Home in London wanted an update of their website and we worked with them to introduce a host of new and exciting features. 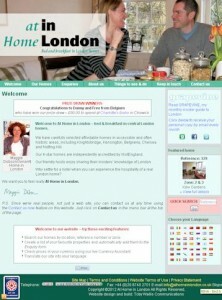 At Home in London is a London-based B&B agency that has been doing business over their website for over 10 years and now does over 90% of their business online. As their website is so critical to their business, Maggie Dobson, the business owner, decided on more than a simple redesign recently. Working with Maggie, we added complex search capabilities, additional listing information such as details of local tube stations, a live feed of what’s on information, weather forecasts and a “Remember List” which lets visitors save a list of homes that catch their eye so they can refer to them when they want to enquire about availability. The website is now fully up-to-date and functional, and the new features have significantly increased the conversion rate from visitors to the site. In another innovation, there is also a Chinese version of the website at www.athomeinlondon.cn, set up following a television programme featuring the company on Christmas Day. We were delighted to be able to help At Home in London develop new ways of offering their customers and prospects a highly-sophisticated service which has place the company perfectly for 2012, a major incoming tourism year for London.